or none of the above? Of course, it is *none* of our business whatsoever, you know we are merely curious and simply had to ask. Although, between the monies collected on behalf of the couple for the sale of the baby photos to both People and Hello, an immense amount of good will be done in places where help is badly needed, and we do applaud the couple for that. A few other tidbits of note that may prove to be of interest to some of our readers. Do you recognize the artwork up above? If you thought of the oh-so-popular email newsletter Daily Candy then you’re right on target, just as they always are. The site will serve as a natural partner for Comcast properties like E! and the Style Channel, he said. In our dreams. We so adore all the newsletters, we can only pray Comcast does nothing to detract from a good thing. (And we openly admit we are just freaks for their artwork. LoveLoveLove it.) This is one piece of virtual correspondence The Princess always enjoys seeing in the electric In-bin, so hopefully any changes are only for the better. Let’s cross all our fingers and all our toes on that thought, shall we? After all, this *is* the cable company we’re talking about. We also have word that the Rugby line from Ralph Lauren is receiving some much-needed TLC in the form of upgrades to its website. Apparently one will be able to shop online in the not too distant future. That is a beautiful development, particularly for the younger crowd, as the label targets a more collegiate demo; it also carries lower price points as well. And since we are discussing lower price points, that provides the perfect segue to alert you to another end-of-summer clearance sale. This time we showcase Brooks Brothers’ sale on their Black Fleece Collection. No big story (actually no story at all), just a note to remind you to head over to B2 if you are fond of Mr. Browne’s designs. As you know, The Princess respects your pocketbook. Lest you doubt her concern over pennies saved becoming dollars earned and all that, some good news from Starbucks if you are a twice a day visitor to their establishments. Big, cold iced grande drinks for just $2 after 2pm are here if you buy something at Starbucks in the morning and you save your receipt. In an effort to get more people back to the stores in the afternoon, the company has rolled the promotion out from now through Sept. 2. Since those big cups of cold caffeine (and other concoctions) can run up to $4, that is not a bad deal; just be sure to have your receipt stamped in the morning to receive the discount when you return in the afternoon. In today’s “Can’t We All Just Get Along” category, Cartier sued Donna Karan yesterday, charging that the designer ripped off its famous “Tank” watch name. The Cartier Tank watch we show below is compliments of Neiman Marcus; it is the ‘Small Tank Solo Steel‘ version, at $2250 with the alligator strap as shown. The Cartier lawyers say the DKNY folks deliberately used the word “Tank” when marketing their watches, making shoppers somehow think the DKNY watches are connected to Cartier. We think not. It seems the watch Cartier is complaining about is a model called the DKNY Women’s Ion-Plated Tank Watch, seen above. We show a version available at the Bon-Ton stores, as shown it is $115. Of course, this watch is available at many other retailers if it appeals to you. Perhaps they’ll all get together after 2pm for a Latte Grande (is there such a thing?) and make nice. 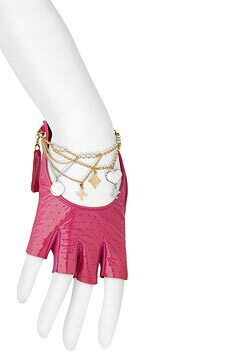 We’ll leave you with this image…one of the hypothetically hot items from the Louis Vuitton ’09 Cruise Line, the fingerless glove with the charms attached to the little bracelet, not yet available for sale, but fascinating to look at nonetheless.